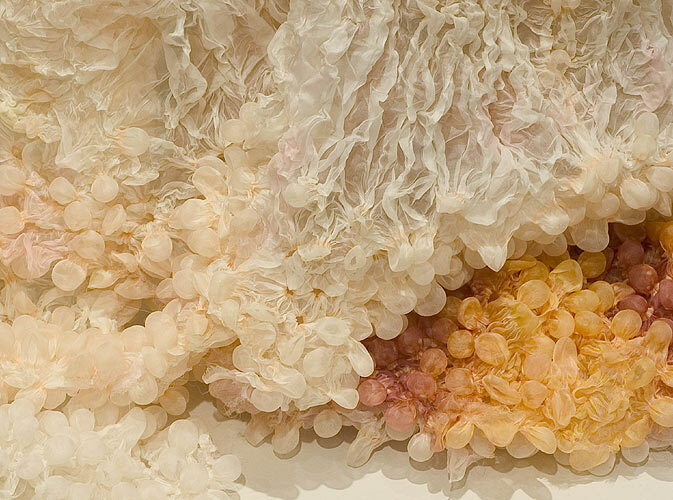 Seattle’s favorite fiber artist Mandy Greer has started a blog, A Quickening, which hosts all sorts of snippets of visual inspiration. Since her first post in late July, Mandy has already managed to fill two pages with gorgeous photographs of art as fashion, as landscape, and as both. Is anyone surprised that the woman who mobilized dozens of volunteers to help her turn West Seattle’s Camp Long into a river of fiber is able to crank out blog content faster than I can take it in? Bookmark it! Barbara Setsu Pickett. Falling Water (detail). Handpainted, shibori-resisted silk organza, 2008. Via aquickening.wordpress.com. ~ by emilypothast on August 17, 2009.